Happy Mantel Monday! 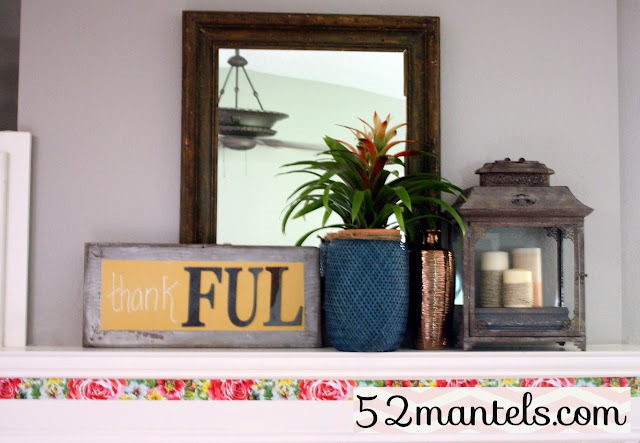 In case you can't tell from the title, today is week 35 of our mantel swapping experiment. 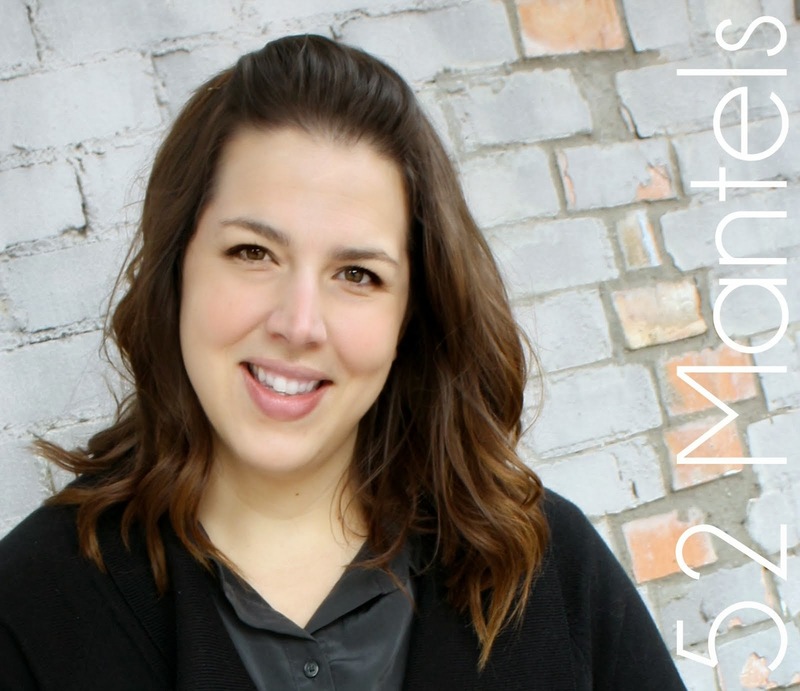 I'm happy to say, only 17 mantels remain! Think balloons will rain down on our heads when we get to 52?? Honestly, I don't really have much to say about this mantel, except...here it is. I will say, it's full of birthday and/or Mother's Day gifts, which is fun and gives me lots to be thankful for! The pretty plant was given to me by my in-laws and the vase and old lantern were gifts from my parents. Have I ever mentioned that May is my favorite month?? Spring weather, blooming flowers, my birthday, mother's day. The goodness just keeps on coming! The tutorial for my chalkboard "FUL" sign is coming tomorrow, so make sure you come back for that! Okay, that seems to be all I've got to say today. Maybe next Monday I'll finish my morning coffee before attempting to explain a mantel. 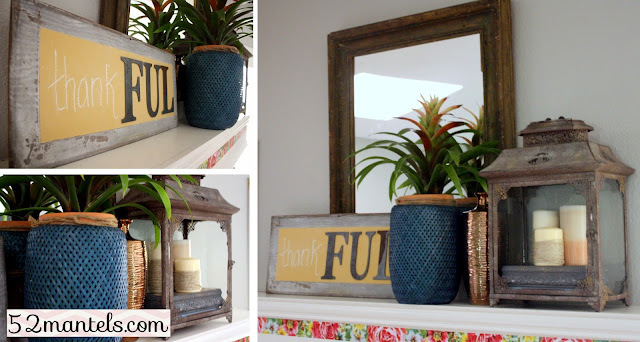 Great mantel, that sign is awesome! Such a beautiful mantel! I really love the blue vase. Where is it from? This is very pretty. It would be very hard for me to change this one. 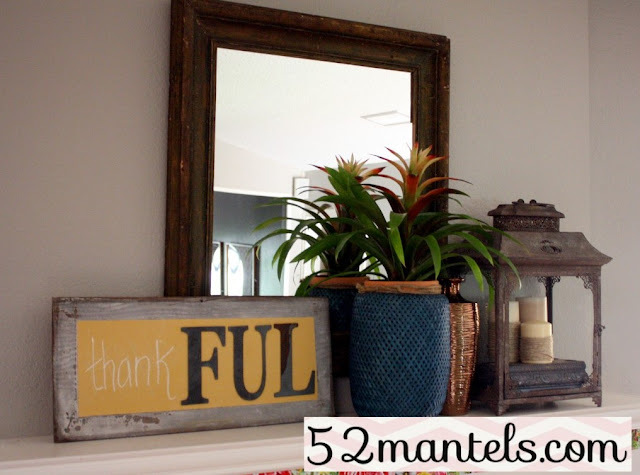 Came over from Overflowing and just left your sign tutorial to see the mantel. Gosh, I really like that lantern - very special gifts!